Considering the impact that disengagement can have on innovation, profitability, customers, and attrition it is clear that top leadership focus on employee engagement is as important (if not more) as on revenue and bottom-line. But more often than not a discussion on Employee Engagement veers towards the operational aspects. The focus is on What to measure, How to measure, techniques of transparent Communication, Design of Employee Surveys, Ideas on Gamification et. al. While all of these are critical to implementing an effective engagement initiative, there is another dimension to Employee Engagement – the strategic aspect that sometimes doesn’t quite get the focus it deserves. There are three axes that help in visualizing the strategic dimensions of Employee Engagement. I call these the “strategic dimensions of employee engagement” and not “dimensions of strategic employee engagement” because to me, by default, all of employee engagement is strategic. If one considers employee engagement to be a “project”, an “initiative” or a “To-Do Item”, then you are almost sure to fail. All three of these dimensions have immense bearing on the extent to which employee engagement will succeed. None of them are short-term activities or projects. All three are interconnected and have to deeply embedded in the DNA of the organization to deliver. There is no way to really measure the extent or direct effectiveness of any of these dimensions on an ongoing basis. But when there is true commitment to these and the right balance is achieved, they have a multiplier effect on the effectiveness of activities undertaken to drive engagement. Leaders are the ones who set the direction for the organization. (Stephen Covey’s famous jungle metaphor where the managers are down below efficiently clearing a path and the leader clambers up a tree and figures out they are in the wrong jungle) To get employees to really feel motivated about doing a good job, you should be guiding them to the right jungle in the first place. While the metaphor does serve to drive home a point, consider the impact it will have on employees when leaders walk into the first clump of trees they think “looks like the right place to go” and then a few hours later decide to survey and say “oops!” When it comes to defining and following organizational principles leaders have to get it right and stick to the path – even when the going gets tough (especially when the going gets tough). The best leaders are those that clearly define and live the organizations principles. They enable engagement by using every opportunity they get, using every communication channel and touch point at their disposal to reinforce their commitment to employee engagement. It’s a continuous sustained two-way communication that yields results with employees believing that the leadership is truly committed to engaging with the workforce and not just mouthing platitudes. TIME Magazine rated the ISRO Mangalyaan as one of the top 25 inventions of 2104. One of the primary reasons the team of scientists and engineers managed this stupendous achievement is their larger sense of purpose. Imagine what would have happened if their mission had been to “get something out there.” If the purpose had been to “try for Mars, maybe we’ll get to the Moon worst case” chances are the bottom of the Indian Ocean is where the spacecraft would have ended. 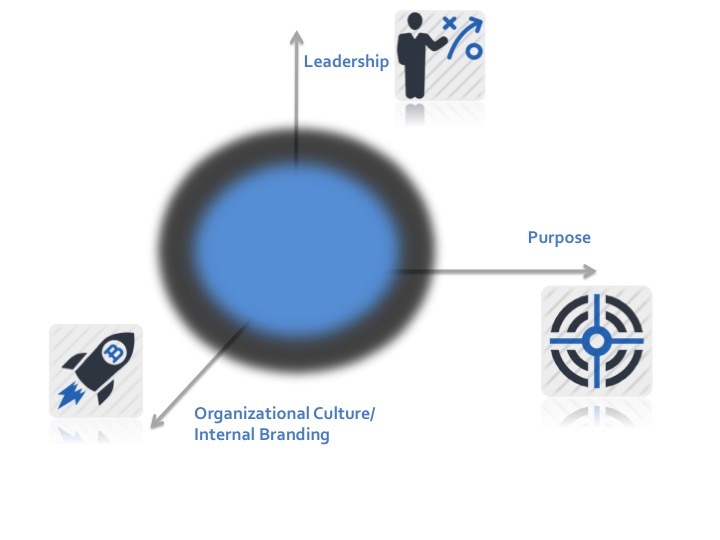 In order for employees to align their personal goals and ambitions with that of the organization they need to understand the mission of the larger whole, the very purpose of the organization. It is only when the purpose is crystal clear that the employees can appreciate the role their own job plays in achieving that purpose. When there is no clarity on what the organization stands for, what it is doing now, and where it is heading chances are the employees are confused about how they are contributing to the success of the business. Taking the previous axis of Leadership into consideration, if employees sense that there is a difference in the stated vision, values and purpose with how the leadership actually functions, then it leads not just to reduced engagement levels, it actually fosters disengagement! You can be rest assured your ‘A’ players will want to leave at the first possible opportunity if you either don’t have a clear purpose or if there is a disconnect between your actions and the stated purpose. Companies have dedicated budgets (often huge) for building their brand in the marketplace. Great care is taken about what is communicated to the customers and the media. Every word is pored over and experts spend millions on A/B testing to get just the right shade of blue on the logo. But what about the employees? The sales and marketing team of most company focus on the “What” – The products, the inventions, the innovations, and the service the company provides. This tells the customer what he can get in return for the money he spends. Companies who believe that they are more than just the products they sell and their employees truly matter also focus on the “Who” – the engineers designing the products, the customer service executives supporting the customers, the managers who make sure projects run on time and finally the leaders who steer the organization in the right directions. Truly engaging firms additionally focus on the ‘Why’ – the raison d’etre. Why does the organization exist in the first place? And when you turn the lens of “Why” onto the organization, things change drastically. “Making money by mis-selling to customers so that we can get fat bonuses” suddenly doesn’t seem a good enough reason for a company to exist in the long run and for top talent to join it. This dimension blends in deeply with the larger purpose and mission of the company that we discussed in the previous point. Conclusion: Employee Engagement is one of the most complex challenges that face the organization while also being the most critical. Market studies, Sales strategies, Revenue, Profit, Share price are all indicators of how well the leadership and management is tackling the challenge. Motivating employees is a complex activity that requires transparency, true-values and years of sustained effort. Among all the questions that leaders of organizations must ask of themselves and answer in a convincing way, is “Why do we exist?” If the organization doesn’t have a good reason to exist, it cannot possibly provide a good reason to others to be a part of it! Nice Post! Very valid points – especially on the topic of a larger mission/purpose. Otherwise employees just feel like cogs in a vast machine with no clue why they are doing what they have been asked to do. And definitely in that situation they have zero motivation to figure out how to do it better.